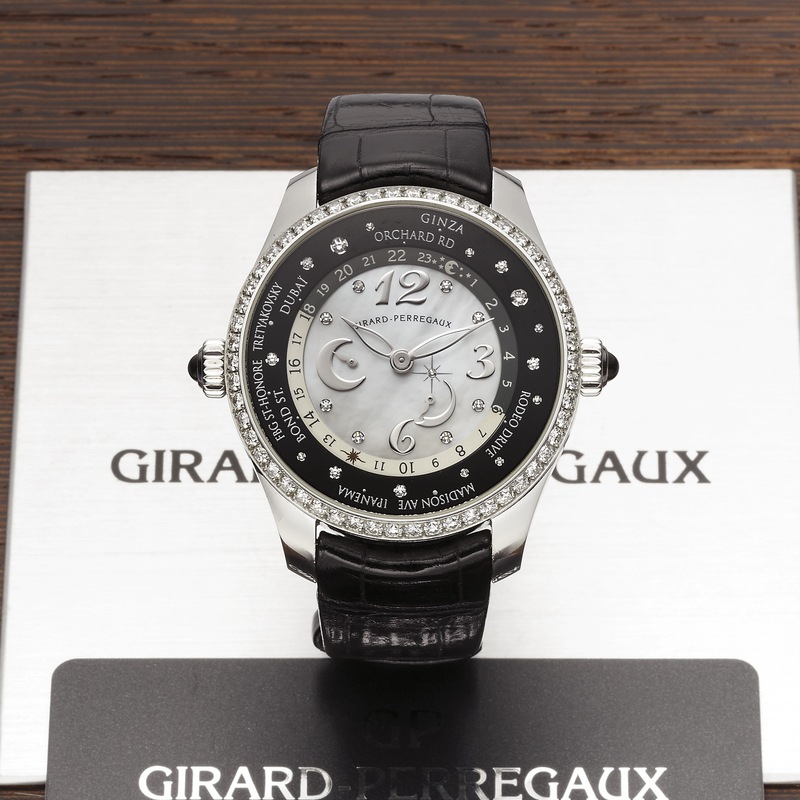 GIRARD-PERREGAUX REF. 49860 WORLD TIME DIAMOND STAINLESS STEEL Girard-Perregaux, World Time, No. 575, Ref. 49860. Made circa 2007. Very fine, large, world time, self-winding, diamond-set stainless steel wristwatch with mother-of-pearl dial, two crowns, 24-hour day and night and power reserve indication and stainless steel Girard Perregaux deployant clasp. Accompanied by the original fitted box, guarantee card and instruction manual. Three-body, polished and brushed, transparent case back with 6 screws, rounded bezel with 54 diamonds (1.95 ct), concave lugs, cabochon sapphire-set screw- down winding crown at 9 to rotate the city disc, cabochon sapphire-set crown at 3 for time setting and adjusting the night/day function, sapphire crystals. Mother-of-pearl with applied diamond indexes and Arabic quarters, outer silver and gray revolving ring with painted Arabic numerals for 24 hours, outermost revolving disc bearing names of 24 world locations, power reserve indication at 5, constant seconds at 9. Skeletonized steel feuille hands. Cal. 33G0.9, rhodium-plated, fausses cotes and oeil de perdrix decoration, 27 jewels, straight-line lever escapement, monometallic balance, shock absorber, self-compensating flat balance spring, hack mechanism. C. Three-body, polished and brushed, transparent case back with 6 screws, rounded bezel with 54 diamonds (1.95 ct), concave lugs, cabochon sapphire-set screw- down winding crown at 9 to rotate the city disc, cabochon sapphire-set crown at 3 for time setting and adjusting the night/day function, sapphire crystals. D. Mother-of-pearl with applied diamond indexes and Arabic quarters, outer silver and gray revolving ring with painted Arabic numerals for 24 hours, outermost revolving disc bearing names of 24 world locations, power reserve indication at 5, constant seconds at 9. Skeletonized steel feuille hands. M. Cal. 33G0.9, rhodium-plated, fausses cotes and oeil de perdrix decoration, 27 jewels, straight-line lever escapement, monometallic balance, shock absorber, self-compensating flat balance spring, hack mechanism. Dial, case and movement signed. DIAM. 41 mm. THICKNESS 12 mm.